DALLAS — A new industry report from Parks Associates finds that as U.S. broadband households spend less time per week watching video on a television, they are watching more user-generated content online, which increasingly includes live broadcast video. The Future of Live Entertainment reports 47% of U.S. broadband households watch user-generated content more than once per month. By the end of 2017, 12% of U.S. broadband households were regularly watching either a live TV show or live events via a livestreaming site or app such as Twitter, Facebook, or Twitch. ABC launched a 24/7 livestreaming network in April 2018 to capitalize on this trend. The Future of Live Entertainment explores the state of live broadcast video, including the renaissance in live video services online, alternatives to traditional linear television, consumer use, and new opportunities for content creators and distributors. It addresses how viewership habits in live entertainment changed with the decline of pay TV and the rise of streaming. The report includes five-year forecasts of live TV viewership, including growth of live viewership and growth of online live viewership. Live-TV viewers ages 18-34 watch 30% of their live content on a TV from online video services. 78% of viewers between the ages of 18-49 report getting news from social media. 35% of digital antenna owners connect their antenna to a streaming media player. Just 37% of U.S. adults reported getting their news from local news, compared to 46% in 2016. 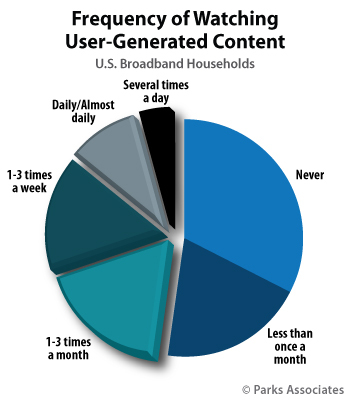 23% of broadband households reported posting user-generated content online in the past 30 days.